In the baking heat in Haringey, I’m trying to talk to a Hungarian about his side, Szekely Land. 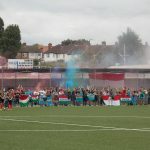 “We are Hungarian,” the half-cut fan and his mates yell repeatedly at a largely empty stadium half an hour before kick-off, pausing to whisper that they have a bag full of flares, and plan to whip them out as soon as the players appear. He looks at the opposition and promises an easy win, dipping into the supremacy of Hungarians over Romanians, while his mate attempts to burn the lace off my shoe to use to tie his flag. He thinks he’s being subtle – I copped it straight away, but figured the cost of the shoelace is worth the madness of the ‘interview’ – and soon three inches of string carefully burnt from my rugged old pair of Sondicos is being used to attach a red, green and white flag with some dubious looking lettering to the pitchside railing. Szekely Land are playing Zimbabwean rural underdogs Matabeleland in the blistering heat, and despite the advantage that might seem to afford the African side, Matabeleland are on a road to sad self-destruction. The men in tribal white and orange start strongly, pressing the Szekely Land side back and making several solid chances. They implode shortly afterwards, their goalkeeper shown a straight red card only twenty minutes in for flying out of his goal and clattering a forward clear through on goal – the first decent Szekely Land chance. From then on, it was only a question of ‘how many?’ The answer was five, and with Padania and Sekely Land both two wins from two against Tuvalu and Matabeleland, Group C is over with a game to spare. It’s hard not to love the naive flare of Matabeleland, but in a stadium surprisingly dense in nutty Hungarians intent on ‘trolling’, maybe some things are for the best. There’s always some fun to be had with Matabeleland, though. This time it came through the ‘keeper’s new way of firing the ball out: an incredible flat kick out of his hands that flew 70 yards at extreme pace, at no more than head height, and caught out Szekely Land several times. It was odd enough to have caught out almost anyone. No Bruce Grobbelaar this time for the Zimbabweans, but he’ll likely be playing tomorrow. 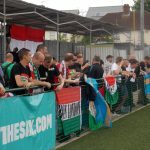 The results from around the ground started trickling in from CONIFA, and a couple stood out. Holders Abkhazia, beaten by this tournament’s Denmark (circa 1992), Karpatalya, another Hungarian ethnic minority, this time in the Ukraine. Western Armenia turned over CONIFA’s number one ranked team Panjab, and Cascadia got their act together to beat hosts Barawa, who looked excellent in their opener (full results below). 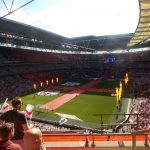 With the madness out of the way and the inevitability of a thrashing at lambs to the slaughter Tuvalu take on ruthless Italians Padania, I decided to take a short break from CONIFA and head to Wembley instead, and catch England’s friendly against Nigeria. I’ve long held the view that international friendlies are basically rubbish. In fact, I’m really struggling to remember a good one: they’re either a chore for a first-team regular, or a chance to break into the team for a player who might get 45 minutes to try and prove his worth with an unfamiliar team. Neither is a recipe for a classic. 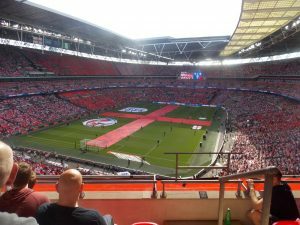 That said, I haven’t been to Wembley since my age reached double digits (which means I haven’t been to the new, arched stadium), and a pre-World Cup game down the road was too good to resist at £30. I spent a lot of the journey to west London talking to Nigerian fans. I’m English, but find England increasingly difficult to watch; I definitely don’t feel a sense of fun around the team. It’s more a sense of regret and frustration over endless underachievement. I personally think that’s unlikely to change this summer, but who knows, I could be wrong. They looked good in the first half, with Deli Alli (booed relentlessly by the away fans) and Ashley Young doing plenty of damage on the wings, though Nigeria were quite poor. They got one back in the second half, with the game finishing 2-1 to England (Cahill, Kane; Iwobi) and the last half hour barely worth watching. 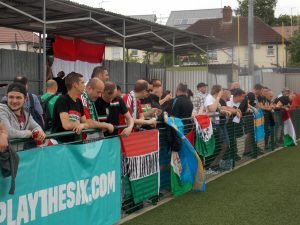 Today, I spoke to found Billy Burkett about London’s soccer movement ‘Terrible Football’, got a touch deeper into the crazy world of Hungarian nationalism, and strolled for coffee with Tuvalu’s playmaker. I also nearly cooked in the unlikely London heat. 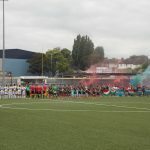 These posts, the CONIFA diaries, are not about all that. 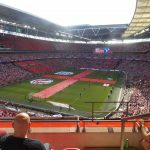 They’re a very basic overview of the tournament through my eyes, written after each match day. I have hours and hours of interviews, background and stories around each team recorded, ready to go in my book, ‘CONIFA: Football For The Forgotten’, which is detailed and available for pre-order here. For obvious reasons, I won’t be telling them all in blog posts. To get the inside track, buy the book! 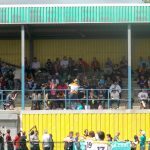 Matabeleland fans dance in the stands at Haringey Borough.